Ethical guidelines exist for a reason. Norms exist for a reason. The reason is not “Jerks who think they’re smarter than us trying to control our lives from on high.” The reason is that human history is long, and all of the mistakes that could possibly be made have been made, and at a certain point people figured out that following some common sense rules could prevent us from making the same dire mistakes over and over again. Mistakes that come from human nature. Mistakes like: allowing powerful people to use their powerful positions to make money for themselves, or allowing powerful people to use their powerful positions to squelch legitimate dissent, or allowing powerful people to use their powerful positions to flout the very ethical guidelines and norms that prior people in powerful positions established to keep people in powerful positions in check. 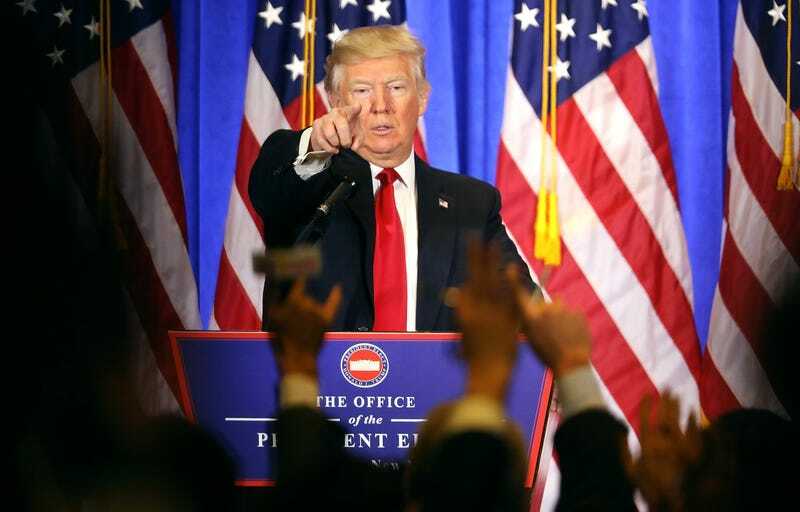 Today we saw a “press conference” by our incoming president at which he put forth a farcical plan to allow his own sons to continue running his vast business empire while he is president, and spoke at length about his belief that as president it is impossible for him to have meaningful conflicts of interest, which is why he felt comfortable presenting his decision to turn down a $2 billion business deal with a Middle Eastern real estate mogul as something noble, rather than as an obvious decision that would be made as a matter of course under a normal presidential administration. He dismissed serious reporting that reflected poorly on him as “fake news,” and promised to retaliate against news outlets that displeased him. These things are not normal. These things are not okay. These are actions that flout well-established ethical and civil norms. Admittedly, there is something thrilling about watching him do this. What will he do next? It always keeps us tuning in, in the same way that a violent alcoholic father will always keep his children on his toes. But we should not fool ourselves about what is happening in front of our eyes. We are all coming to realize that our civil society institutions may not be strong enough to protect the flawed but fundamentally solid democracy that we thought we had. We are witnessing the rise to power of a leader who does not care about norms. Since these norms were created to prevent political, social, economic, and cultural disasters, we do not need to wonder how this will end. It will end poorly. This is why you don’t kiss the ring of Donald Trump. This is why you don’t visit him in his golden tower and sit stiffly in a spacious conference room to hear his nonsensical thoughts about “innovation.” This is why you don’t tousle his hair playfully on late night television, or allow him to hold off-the-record meetings with your news organization. This is why you don’t pose in smiling pictures with him, or defer to him out of some misplaced sense of decorum or respect for the office he is soon to occupy. This is why there was so much fear over the “normalization” of what he is and what he represents. Our society and our institutions are simply not set up to deal with someone who is fully prepared to flout all of our norms of good behavior. Our system, to a large degree, relies on social sanction rather than laws to prevent powerful people from getting too far out of line. When our most powerful person is willing to ignore all of that, there is not much in place to stop him. The normalization process is well underway. The pomp and circumstance and deference will only increase after the inauguration. The press and the Congress are the only two institutions standing between a dangerous man and total power. They must both realize this is not the time to salute and grovel. This is not the time to fall into familiar patterns of default respect for someone who does not himself respect the responsibility to the public that he has been given. This is the time for them to rise to the occasion. And the occasion is a fight for civil society.